From the Lehigh Valley Health Network, Allentown, PA; and the Department of Family Medicine, University of South Florida Morsani College of Medicine, Tampa. Introduction: Patient-centered medical homes (PCHMs) aspire to transform today's challenged primary care services. However, it is unclear which PCMH characteristics produce specific outcomes of interest for care delivery. This study tested a novel typology of PCMH practice transformation, the PCMH framing typology, and evaluated measurable outcomes by each type. Methods: Using the Patient-Centered Primary Care Collaborative 2012 to 2013 Annual Review, this secondary analysis of the published PCMH literature extracted data from publications of 59 PCMHs. Each of the 59 sites was categorized as 1 of 4 PCMH types: add-on, renovated, hybrid, or integrated. Six outcome measures (cost reductions, decreased emergency department/hospital utilization, improved quality, improved access, increased preventive services, and improved patient satisfaction) were independently coded for each site. Practices were combined based on type, and mean outcomes scores for each measure were displayed on radar graphs for comparison. Results: While each type showed a characteristic pattern of success, only the integrated type improved in all 6 outcomes. No type achieved high success in all measures. Discussion: There seem to be 4 types of PCMH, each of which shows a distinctive outcomes profile. Within the PCMH framing typology, direction is emerging for how best to transform primary care to achieve the greatest success. The 10th anniversary of the patient-centered medical home (PCMH) has arrived. While a host of pilots and demonstrations have been implemented at the practice, network, and state levels over these years, we still do not have full agreement for what a PCMH is. Definitions of the PCMH build on practice characteristics, describing a “place of care integration, family and patient partnership and engagement, operationalization of the primary care core attributes of personal, first contact access, comprehensive and coordinated care,” but what is emphasized at the practice and health system levels varies considerably throughout the country.1 Over the past 10 years, attempts have been made to standardize and evaluate PCMHs, from the National Committee for Quality Assurance's metric-driven achievable designations to the Patient-Centered Primary Care Collaborative's (PCPCC) annual reviews of the PCMH evidence.1,2 Nonetheless, PCMH activities still vary with respect to how to study, evaluate, and analyze the transformation to a PCMH and the outcomes these changes have produced. The central question remains, Which characteristics of a PCMH are particularly linked to producing the outcomes that we are searching for within the triple or quadruple aim? A 2012 tertiary review of the published PCMH literature to date by the second author revealed at that time a possible typology of PCMHs. As reported preliminarily, at least 4 versions or types of the PCMH may exist, including the “add-on,” the “renovated,” the “hybrid” stage, and the “integrated” PCMH.3 If in fact there are 4 types of PCMHs, analysis of the outcomes profiles attributed to each type would be helpful to health systems and current efforts to transform primary care. In this article we present our research: a detailed secondary analysis seeking to evaluate the proposed typology hypothesis in question. Through a thorough evaluation of primary data from published articles about PCMHs based on a data set of 59 practices cited in the 2012 to 2013 Patient-Centered Primary Care Collaborative (PCPCC) Annual Review of Evidence, we sought to categorize each of those 59 sites as 1 of the 4 types, then evaluate what outcomes were produced by each type of PCMH. Through the creation of the PCMH framing typology, as described in this article, we have created a guide for understanding these PCMH characteristics of structure, function, and outcomes. With a clear understanding of what defines each type of PCMH, along with the profile of successful outcomes produced by each type, primary care transformation efforts across the country may be able to focus energies on PCMH characteristics that produce the highest likelihood for success in achieving the triple and quadruple aims. We undertook a detailed secondary analysis of the entirety of the published literature regarding the 59 primary care practices reported in the PCMH Annual Review of Evidence, 2012 to 2013, from the PCPCC.2 That report cited 76 published peer-reviewed articles or industry press releases. Specific to 2012 to 2013, it was the final year of the Annual Review that included a literature review that culminated in a compilation of the full and comprehensive list of all published new data on PCMHs publically available at that time (for annual reviews after this year, given the rapidly expanding body of published PCMH literature, only additions to the literature in specific categories are highlighted). One author (AMK-E) read all 76 published articles or press releases that were cited in this annual review and extracted data directly from these 76 source publications into an Excel spreadsheet (Microsoft Corp., Redmond, WA) (Tables 1 and 2) before analysis and evaluation. Data extracted from each of the articles included details related to the characteristics and structure of the PCMH itself, as well as outcomes reported to date for each site. Outcome measures were categorized into 6 types, in keeping with the same metrics used by the PCPCC in their annual review of the data. These measures were (1) cost reductions; (2) decreased utilization, including both emergency department and hospital admissions; 3) improved health; 4) improved access to care; 5) increased preventive services; and 6) improved patient satisfaction. From the 76 published peer-reviewed articles or industry press releases, 58 discrete PCMH clinics or demonstration projects and 1 state employee incentive program were described. Characteristics of each of the 59 sites were extracted from the primary data source, compiling variables aimed at understanding their label within the PCMH framing typology and for the 6 outcomes measures listed above. Only outcomes measures data from published sources were included in this analysis. At that time, data for any of the outcomes measures were not collected from secondary sources beyond these 76 publications. This allowed for the ability to analyze the characteristics and outcomes measures of sites as reported at a static moment in time, and did not introduce bias between sites that may have had updated information publically available compared with other sites that were not yet at that point. 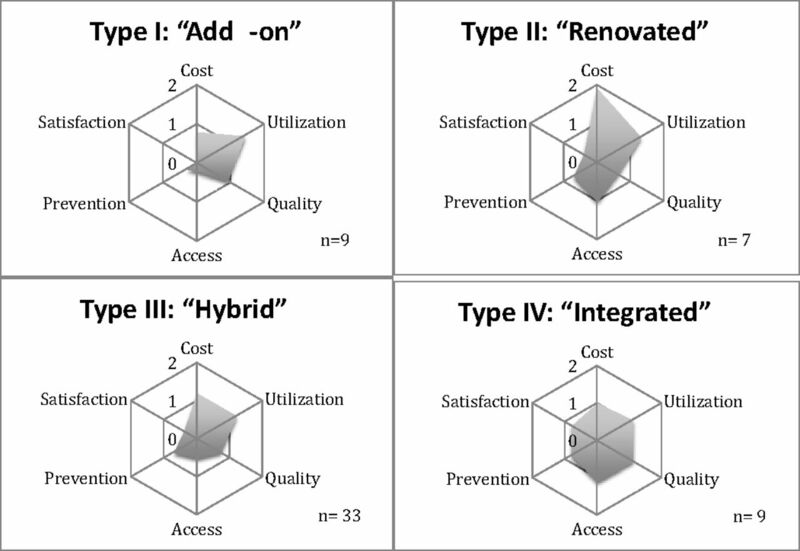 The PCMH framing typology used for defining practices in this study includes the following 4 types of PCMHs: the “add-on,” the “renovated,” the “hybrid,” and the “integrated” (Figure 1). We hypothesized in this PCMH framing typology that a PCMH transformation can occur either by adding a care manager and/or an electronic medical record (EMR) registry to add value to current clinic work processes for particular disease states, or by renovating and redesigning the existing work flow of the clinic toward team-based care, including expanded and innovative access points for patients. Some clinics may combine a hybrid of the 2, using both add-on and renovated aspects to provide more targeted and improved care for different patient populations. Some PCMHs may move further to become integrated within their practice and the local community, through integration with mental health and/or greater inclusion of the larger community and medical neighborhood where the practice resides. 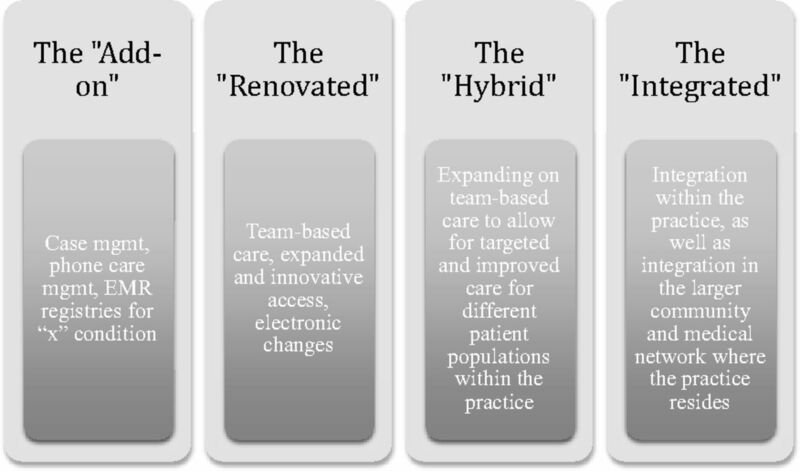 These 4 types are descriptive of what has emerged within all the PCMH transformation activity over the past 10 years. The PCMH framing typology is a description of what happened, not necessarily what was intended to occur. Patient-centered medical home framing typology: types 1 to 4. EMR, electronic medical record. Data collection for the research study began with the development of a list of variables that would allow us to label a clinic or demonstration project along this PCMH framing typology (see Table 1). These practice characteristics of interest included adding a care manager for specific diseases, care managers for team care, registry capabilities, scheduling updates, EMR/electronic updates, care teams, doctor-task redesigns, payer redesign, integrated mental health, and community input/community resources network. The primary author (AMK-E) then read through each of the primary source documents, extracted all relevant details related to any of these variables, and recorded the data into an Excel database. Specific combinations of variables are hallmarks of each PCMH type (Table 1). The add-on type requires a site to have added a care manager for specific diseases, often using a registry for specific diseases. This type may sometimes exhibit a care team organized around 1 specific disease and payer redesign focused on that disease, for example, diabetes case management programs. The renovated type requires that a site has substantially redesigned the way care is delivered, with the addition of at least some of the following variables: care managers for team care, registry capabilities, scheduling updates, EMR/electronic updates, care teams, doctor-task redesign, and payer redesign. When a practice uses elements of both the add-on and renovated features, the hybrid type of PCMH is realized. Finally, in an integrated PCMH, some or all the first 8 practice characteristics are found, along with an element of integration, through integrated mental health and/or integration with community input/community resources network and the medical neighborhood. Using these specific parameters for each of the PCMH types, both authors coded the 59 sites independently; after analysis of each practice's variables listed in the database, a clinic or demonstration project was labeled as type 1 to 4 within the PCMH framing typology (Figure 1). We then compared and discussed our assigned label for each practice. Any incongruence between our codes was deliberated in detail, and we referenced the primary data source until congruency could be achieved for a label of 1 to 4. Outcomes measures, as noted above, were characterized in concordance with the PCPCC's annual review measures of interest and included cost reductions, decreased emergency department and hospital utilization, improved health, improved access to care, increased preventive services, and improved patient satisfaction.2 Data were extracted from each of the 76 primary source publications by the first author and placed into each outcomes measure category in the Excel database. To ensure completeness of the secondary literature analysis by the first author in this study, cross-comparisons of the data were analyzed against the outcomes measure categories that were reported as “yes” or “no” by the PCPCC in their annual review document for each of the 59 practice sites.2 Discrepancies between our data extracted from the published primary sources and the PCPCC's yes/no categories for each outcome measure were investigated with thorough cross-referencing of primary source publications and confirmed by primary source documentation. Across the 76 discrete publications, outcomes measures had no standard language or definition in the literature on how to report improvement. A practice may report cost reductions as a return on investment; as a per-member, per-month reduction; as a reduction in total costs; or as a per-member, per-year reduction. Most of these figures are unable to be transferred to a common scale for comparison between sites using the published information available publically. To allow for comparison between sites reporting nonstandardized outcomes, we created a weighting system that placed equivalent levels of outcomes achieved at the same numeric score. This coding algorithm assigns a 0, 1, or 2 to each of the 6 outcomes measures; we developed this algorithm to reflect equal weighting across multiple metrics described (Table 3). The primary author (AMK-E) then analyzed the database for each of the outcomes measures for each practice and gave each site an outcome of 0, 1, or 2 for each of their 6 outcomes measures, depending on how significant the practice's data were in its published studies. The second author then independently reviewed the database and confirmed the appropriate outcome score was awarded for each measure. These scores were based on level of achievement, and not on change, so that practices that were already performing well, with little room for improvement, were so acknowledged. In addition, to achieve a 2 for improved health, a site had to either show significant improved health among its patient population or have improved all its Healthcare Effectiveness Data and Information Set measures by at least 10%. Only 3 sites achieved this high rating, and we determined that this category should be renamed “improved quality (disease metrics),” given how little emphasis was placed on actual health markers—that is, mortality and morbidity—in the published literature. After each site was labeled as type 1 to 4, and after all 6 outcomes measures for each site were given a score of 0, 1, or 2, we then combined data across each type of PCMH to create radar graphs; these graphs depicted how much and what outcomes were produced by each of the 4 PCMH types. The 59 discrete sites were grouped together based on type, and the mean outcomes scores were calculated for these 4 grouped types. The mean outcomes scores then were used to create 4 radar graphs in order to easily visualize the different metrics on a common scale while allowing for cross-comparison across the PCMH framing typology (Figure 2). Radar graphs showing 6 outcomes measures—cost reductions, decreased emergency department/hospital utilization, improved quality/disease metrics, improved access to care, increased preventive services, and improved patient satisfaction—based on type of patient-centered medical home. Of 59 distinct practices or sites discussed in published outcomes studies to date, we found that 9 were the add-on type and 7 were renovated. The large majority of practices or sites (n = 33) were a hybrid of both add-on care management and renovated team design. Nine sites showed characteristics of an integrated PCMH, in which mental health or social services were truly integrated into the practice itself. Notably, 2 of these 9 integrated sites seemed to transform even further into a PCMH in which the community itself is an integral force in shaping and implementing its own vision of the medical care system. One site did not fit into the PCMH framing typology system because it was a state-level initiative to incentivize employees to get needed medical services and did not require any PCMH recognition efforts for employees' medical care centers. Add-on clinics were able to achieve modest success in significantly improving utilization and somewhat improving cost and disease metrics, although they provided little or no improvement for other measures like access or prevention (Figure 2). Renovated clinics, in which a team-based model of care was developed and refined, showed significant improvements in cost, utilization, and access compared with the add-on clinics alone, but they lacked improvement of quality disease metrics or patient satisfaction (Figure 2). Hybrid clinics, a mixture of types 1 and 2, do not seem to be additive in success but mimic the renovated types, albeit with less effect (Figure 2). Integrated clinics show the best balance of outcomes; it was the first of the radar graphs to show improvements in all 6 measures (cost, utilization, access, quality disease metrics, prevention, and patient satisfaction) (Figure 2). How do we know the PCMH will actually be successful? This question has yet to be definitively answered in today's era of rapidly changing health care reform. While the PCMH concept aspires to fulfill the triple and quadruple aims and transform today's challenged primary care services, there are still unclear expectations of how a PCMH demonstrates success, on what scales, and with which outcomes. The PCMH framing typology aims to provide an understanding of how PCMHs are currently developing and of what aspects and qualities of a PCMH produce the largest positive outcomes in cost, utilization, access, quality, prevention, and satisfaction. In addition, it is an important objective of primary care to be always striving to optimize and improve a multiplicity of goals. As we search for the best paradigm for care transformation, we suggest not only that primary care's efforts should ideally produce 1 or 2 positive outcomes, but also—and more importantly—that the primary care roadmap that achieves the most success among the diverse group of outcomes be our target. One site listed in the annual review did not fit into the PCMH framing typology. This site was a state-level payment reform initiative that encouraged patients to get needed preventive and healthy living testing, regardless of what type of clinic or PCMH they actually belonged to. Interestingly, this site did show notable positive outcomes measures, regardless of PCMH status, achieving a score of 2 in both cost and utilization reductions, and a score of 1 in improved access and improved preventive services. It seems that by directly motivating patient employees themselves with payment reform, impressive cost and utilization reductions as well as improved access and preventive services may also be achievable, regardless of whether clinics are trying to become a PCMH. Such solo payment reforms have interesting implications for current policymakers, as we continue to search and refine what makes for the “best primary care” infrastructure and delivery system nationally. This particular model suggests an additional method to consider as a supplement to the PCMH for achieving the triple and quadruple aims, and illuminates our need for continued discussion on payment reform and how it may be a crucial step in primary care transformation. Much research and energy are currently being invested nationally on primary care transformation. “The 10 Building Blocks of High-Performing Primary Care” described by Bodenheimer et al12 is 1 such research model that provides guidance for practices trying to achieve the triple and quadruple aims. In comparing the PCMH framing typology against the building block model, it becomes apparent that these models, when evaluated in tandem, crystalize an understanding of the steps and processes necessary for transformation. For instance, in our add-on stage, partial improvements are made in building blocks 1 (engaged leadership), 2 (data-driven improvement), 3 (empanelment), and 6 (population management). The hybrid stage includes total improvement in blocks 1 (engaged leadership) and 2 (data-driven improvement) and partial improvement in blocks 3 (empanelment), 4 (team-based care), 6 (population management), and 8 (prompt access to care). The integrated practice, type 4, shows the most building blocks achieved, with total improvement of blocks 1 (engaged leadership), 2 (data-driven improvement), 3 (empanelment), and 4 (team-based care) and partial improvement in blocks 5 (patient-team partnership), 6 (population management), 8 (prompt access to care), and 9 (comprehensiveness and care coordination). Our study and the PCMH framing typology describe what has actually emerged as practices have worked to become PCMHs, whereas the building block model describes what has worked best. Notice that access and population management are often implemented before the initial building blocks are solidly in place. This might partly explain the less-than-inspiring results seen in our study. Our study has a few limitations, specifically with regard to characterization of practices into both types and outcomes reported. Given that this study looked only at the primary literature reported in the 2012 to 2013 PCPCC annual review, a practice may have had outcomes measures available but not published at that time. Another major source of variation, which we attempted to control for with the radar graphs and by plotting all measures on a 0-to-2 scale, is the lack of a common vernacular in terms of how practices go about reporting data. Thus, a return on investment of 4× may or may not be the same order of magnitude improvement as $1 million in annual savings; for the purposes of this study, however, we developed somewhat arbitrary cut points for categories 1 and 2. It is hoped that, as we continue to develop and refine outcomes measures nationally, a common set of metrics will be agreed on to allow simplified comparisons between practices.13 We also need systematic measures of better health and practice joy to measure where PCMHs are achieving these goals. After 10 years, what next for the PCMH? We believe that enough is now known for both policymakers and primary care leaders to pause and reevaluate this question. Much progress has been made, and extensions of the current PCMH should continue to evolve and be evaluated. We also recommend more active pursuit of alternative models. Through the PCMH framing typology, 4 types of PCMHs are emerging, and each results in a different outcomes profile. None of them are yet achieving outstanding success, although the integrated PCMH seems to be having a positive effect on all the assessed goals for primary care. We have not yet achieved transformation, but hopeful signs and directions are emerging. To see this article online, please go to: http://jabfm.org/content/30/4/472.full. Received for publication February 17, 2017. Revision received March 18, 2017. Accepted for publication March 29, 2017.
. Patient-centered medical home (PCMH) recognition: a time for promoting innovation, not measuring standards. J Am Board Fam Med 2014;27:309–11. The medical home's impact on cost & quality: an annual updated of the evidence 2012–2013. Patient-Centered Primary Care Collaborative, January 2014. Available from: https://www.pcpcc.org/resource/medical-homes-impact-cost-quality. Accessed June 13, 2017.
. Meeting the challenge of a more person-centered future for US healthcare. Glob Adv Health Med 2016;5:51–60.
. Process and outcomes of patient-centered med care with Alaska Native people at Southcentral Foundation. Ann Fam Med 2013;11(Suppl 1):S41–9.
. Case study of a primary care-based accountable care system approach to medical home transformation. J Ambul Care Manage 2011;34:67–77.
. Initial lessons from the first national demonstration project practice transformation to a patient-centered medical home. Ann Fam Med 2009;7:254–60.
. The cost of sustaining a patient-centered medical home: experience from 2 states. Ann Fam Med 2015;13:429–35.
. The patient-centered medical home's impact on cost and quality: annual review of evidence, 2013–2014. Patient-Centered Primary Care Collaborative, January 2015. Available from: https://www.pcpcc.org/resource/patient-centered-medical-homes-impact-cost-and-quality-annual-review-evidence-2013–2014. Accessed June 13, 2017. UnitedHealth Group. Advancing primary care delivery: practical, proven, and scalable solutions. Available from: www.unitedhealthgroup.com/∼/media/UHG/PDF/2014/UNH-Primary-Care-Report-Advancing-Primary-Care-Delivery.ashx. Accessed June 20, 2017.
. Do provider service networks result in lower expenditures compared with HMOs or primary care case management in Florida's Medicaid program? Health Serv Res 2014;49:858–77.
. A guide to real-world evaluations of primary care interventions: some practical advice. October 2014 AHRQ pub no. 14–0069-EF. Available from: https://www.mathematica-mpr.com/our-publications-and-findings/publications/a-guide-to-realworld-evaluations-of-primary-care-interventions-some-practical-advice. Accessed June 20, 2017.